Twelve-year-old Ellie Galbreath was interested in photography, but when her mother researched programs, many had older age requirements or were too expensive. Not Picture Your World, which gives cameras to youngsters between 8 and 18, sending them into nature with a professional photographer and naturalist. The result was on display at Joske’s Pavilion in Brackenridge Park on Monday, as the young photographers and their parents arrived to celebrate the unveiling of a new 18-month calendar of their work. 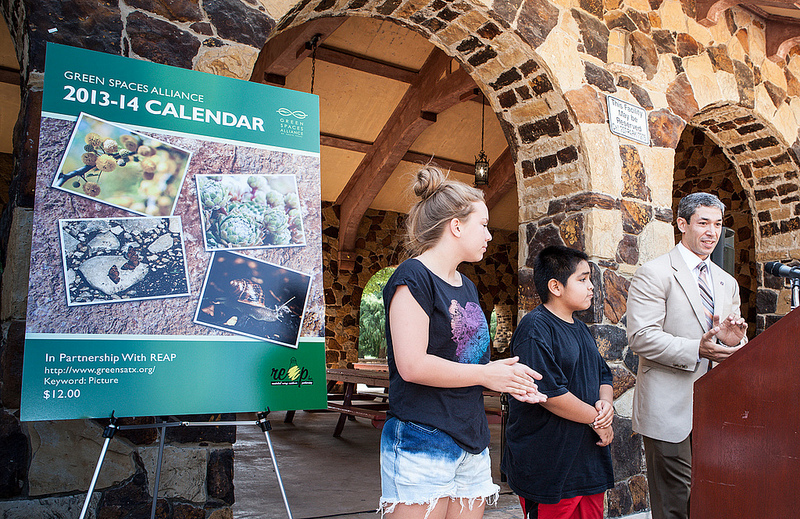 The calendar will be sold by Green Spaces Alliance of South Texas, a non-profit educational organization working to protect the natural environment and provide opportunities to the public through land conservation, education, and community engagements. One of those opportunities is the Picture Your World program, established in 2002. From September through April, the kids go out once a month to a natural area around San Antonio, learning not just to point and shoot, but to recognize the beauty and value in the natural world. Proceeds from calendar sales will benefit Green Spaces Alliance and CPS Energy’s Residential Energy Assistance Program, or REAP, which helps low income customers pay their bills. Ellie and her mother were on hand for the calendar unveiling, joining several of the other young photographers and their parents, along with District 8 Councilman Ron Nirenberg. District 8 Councilman Ron Nirenberg called the young photographers up to sign promotional displays of their work. Picture Your World holds a photography contest each May; the kids are encouraged to submit their best work for the chance of winning cash prizes. 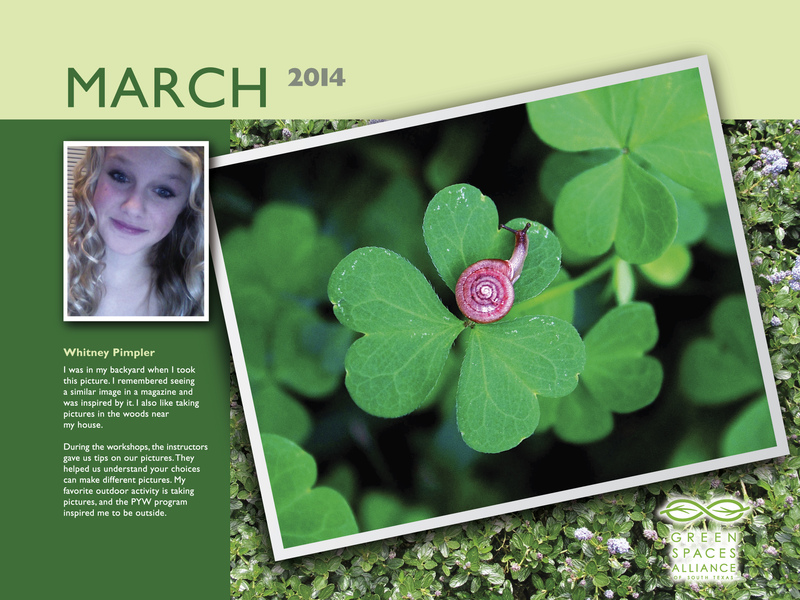 Green Spaces then holds an award ceremony and photo exhibit of all the students’ work. Douglas Rigdon, 13, has been in the program for more than four years now, making him one of the elder statesmen in the program. Picture Your World receives a majority of its funding from Valero and CPS Energy.